Corleone Kush Feminised by Cali Connection Seeds is sure to become a welcomed addition to any cannabis garden due to its many desirable growing traits. Capable of delivering a powerful hit, these performance focused cannabis seeds are ideal for growing weed indoors and outdoors. 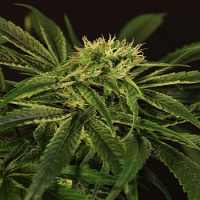 Flowering within 8 weeks, these marijuana seeds will allow you to enjoy yields of up to 450g/m2 and an October harvest.